A “short, stocky, active, aggressive” second baseman, Otto Knabe teamed with shortstop Mickey Doolan to provide the Phillies with one of the most notorious double-play tandems of the Deadball Era.1 After seven years in Philadelphia, Knabe jumped to the Federal League in 1914 to lead the Baltimore Terrapins. But in Baltimore and two later minor league stops, the relentless drive that defined his on-field play may have exhausted the teams he managed. Knabe’s post-playing days were also marked by gambling controversies. Franz Otto Knabe was born on June 12, 1884, in Carrick, Pennsylvania, then a town south of Pittsburgh, now a neighborhood within the city itself. His father, Adam, had emigrated from Germany, and worked as a coal mine foreman. His mother, Sarah, was of Pennsylvania stock. Otto was the fourth of nine children. Prior to the May 18, 1907, game against the visiting Reds, Gleason was injured in batting practice. Murray inserted Knabe into the starting lineup. Philadelphia won eight of their next nine. For the next seven years, Knabe was the Phillies’ second baseman, playing 931 games for the team at the position, a franchise record that stood until Tony Taylor eclipsed it in 1969. At the plate, the right-handed Knabe produced fairly well as a rookie, with a 114 OPS+ in 1907. From 1908 through 1913, however, his OPS+ numbers languished in the 80s. Even so, he capably adapted his approach as his place in the lineup varied. In his first two seasons, he usually hit second. In 1909 he started in the leadoff spot, then down to second, before being dropped into the sixth hole. In 1910 he again predominately batted second and led off in 1911. 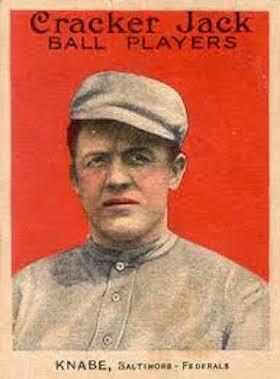 He batted mostly fifth or sixth in 1912, then hit second in 1913. “Otto knows the sacrifice game to perfection and rarely fails to lay down a successful bunt when a base runner is to be shoved up a peg,” stated Richter.22 Knabe led the National League in sacrifice hits each season he was mostly hitting second. But when Knabe was assigned the leadoff spot in 1911, he tightened his plate discipline and his SO/W ratio improved (from 0.89 in 1910) to 0.37. Longtime Phillies catcher Red Dooin replaced Murray as manager. The trade talk receded. The Phillies slightly rebounded in 1910 to a 78-75 finish. That offseason, despite Fogel’s initial interference, Dooin obtained Hans Lobert and Dode Paskert in a major trade.26 Knabe was signed to a three-year contract at $3,000 per season. Rookie pitchers George Chalmers and Pete Alexander were recruited. In 1911 the rebuilt Phillies finally contended. As late as July 20, the team resided in first place with a 52-32 record. But John Titus broke a leg, Sherry Magee was suspended for a month, then Dooin broke a leg as well. Philadelphia faded to a 79-73 finish. Dooin made off-season salary demands. Fogel countered by floating Knabe as a likely replacement manager. Eventually terms with Dooin were reached. The Phillies underachieved to a 73-79 mark in 1912. Knabe was “exceedingly ambitious” and a new series of rumors fueled his aspirations in August 1912.27 This time, the Reds sought him to replace Hank O’Day as their manager.28 But Fogel was preoccupied with launching wild claims that the pennant was being fixed for the Giants, and the deal likely evaporated in the controversy. In December, with the whole of the NL against him, Fogel resigned. William Locke assumed ownership of the team, backed Dooin, then promptly fell victim to cancer.29 The 1913 edition of the Phillies again raced out to a fine start. By June 25, Philadelphia stood in first place, 4 1/2 games ahead of the Giants, with a 38-17 record. But the team then lost 13 of 16 games over a lengthy homestand, and fell 7 1/2 games behind New York. “The players appear to have lost all of their pepper, aggressiveness, and ambition,” noted a correspondent.30 The Phillies couldn’t close on the Giants, finishing a distant second at 88-63. Locke died on August 14, 1913. A couple minor shareholders friendly to Knabe floated his name as an alternative to Dooin. But Locke’s cousin, William Baker, assumed ownership that October and strongly backed the skipper.31 In December, Dooin proposed sending Doolan and Knabe—plus any of the pitchers save Alexander or Tom Seaton—to the Reds for Joe Tinker and Heinie Groh.32 But fast-moving events overtook the moment. The Reds named Buck Herzog as their new manager. Tinker was severing his ties to the National League to jump to the ascendant Federal League. And Otto Knabe, after seven seasons of not progressing with the dysfunctional Phillies, was following Tinker’s lead. Baltimore ecstatically welcomed back major league baseball, and 30,000 fans saw the Terrapins defeat Buffalo on opening day. The squad possessed better-than-average talent, thanks in part to Knabe helping to recruit Doolan and Jimmy “Runt” Walsh from the Phillies. By May 27, Baltimore had raced out to a 22-7 mark, 7.5 games ahead of the pack. But the Terrapins played only .500 baseball over the remainder of the 1914 season, eventually finishing in third place with an 84-70 record. Excepting the addition of Chief Bender to the pitching staff, the Terrapins were mostly the same squad in 1915. The team was even less impressive in its second season. On June 8, at Brooklyn, Terrapins southpaw Bill Bailey yielded an eighth-inning grand-slam to Fred Smith. “Knabe threw his glove in the air and strode to the box to give Bailey a fine little tongue lashing.”36 The 5-3 loss dropped Baltimore to 16-27. Knabe tried a few lineup changes, including benching himself (after a poor OPS+ of 72 in 1914, he achieved an OPS+ of 91 in 1915). But he faced a Federal League irony: many of the underachievers were tied to long-term contracts, and access to minor league resources was lacking. Attendance plummeted, a few veterans finally cut or dealt away, and the Terrapins finished in the cellar, with a 47-107 mark. With Richmond of the AA International League floundering in May 1917, Knabe was hired to manage and play second base. But the Virginians finished in last place. Cubs manager Fred Mitchell brought Knabe back to the majors in 1918 as a coach. Chicago won the pennant and faced the Red Sox in the World Series. From behind the third base line, Knabe and his Boston counterpart, Heinie Wagner, both verbally rode the opposition and each other. Between innings in Game Two, Knabe insulted Wagner to a breaking point, and the two coaches engaged in a “private brawl” under the Comiskey Park grandstands.38 Knabe got the better of the scrap, but the Red Sox got the better of the Cubs, taking the Series in six games. Knabe ran a tavern in Philadelphia after the gambling indictment. He had married Kathryn Welsh after the 1911 season; the couple did not have any children. In 1950 he suffered two paralytic strokes, which (at least temporarily) left half his body paralyzed. On May 17, 1961, another stroke led to his death. Survived by his wife, Otto Knabe was buried in Philadelphia’s New Cathedral Cemetery. 1 Sporting Life, December 21, 1907, 3. Although Knabe was almost inevitably described as short in his era, the author was unable to find any specific contemporary listings of his height. Later in life, Knabe’s WWII draft registration card lists him as 5-foot-4. 2 “Grizzlies Win Last Home Game of the Season,” Denver Rocky Mountain News, September 8, 1905, 8. 3 A. R. Cratty, “Pittsburg Points,” Sporting Life, October 21, 1905, 14. 4 “News Notes,” Sporting Life, June 16, 1906, 10. 5 “Knabe to Return,” Toledo News-Bee, September 24, 1906, 6; “Has Knabe Been Sold?” Toledo News-Bee, December 18, 1906, 6; Veteran [pseud. ], “Cutting Strings,” The Sporting News, January 1, 1907, 1; the Otto Knabe affidavit from the 1915 The Federal League of Baseball Clubs vs. The National League, et al. available via SABR.org/research/1915-Federal-League-case-files, accessed March 15, 2015. 6 Stan Baumgartner, “Miller Another Doolan with Phils?” The Sporting News, February 18, 1948, 3; “Otto Knabe, Brilliant Quaker Infielder, As Seen by Sid Smith,” Chicago Examiner, July 14, 1908, 9. 7 Francis C. Richter, “Philadelphia Points,” Sporting Life, May 16, 1908, 3. 8 “Notes of the Game,” Cincinnati Enquirer, July 24, 1910, 14. 10 Francis C. Richter, “Philadelphia Points,” Sporting Life, September 10, 1910, 7. 11 William G. Weart, “Knabe is Shining,” The Sporting News, July 6, 1911, 1. 12 Stan Baumgartner, “Phillies Tab Keystone Kids as Future Crack Combine,” The Sporting News, September 7, 1949, 11. 13 Harold C. Burr, “Baseball—Chapman Guides for Keeps in 1946,” Brooklyn Daily Eagle, September 9, 1945, 24. 14 Jim Nasium [Edgar Wolfe], “Billy Murray’s Death Recalls Early Dramatic Episodes,” The Sporting News, April 8, 1937, 5. 15 A. R. Cratty, “Pittsburg Points,” Sporting Life, August 13, 1910, 5. 16 “Notes of the Game,” Cincinnati Enquirer, June 17, 1910, 8. 17 “Baseball Gossip,” Cincinnati Enquirer, August 4, 1911, 8. 18 Grover Cleveland Alexander, “Alexander’s Rookie Days Were Real Rough Compared to Today,” (New Orleans) Times-Picayune, June 13, 1930, 22. 19 A. R. Cratty, “Pirate Points,” Sporting Life, August 29, 1908, 6. 20 Francis C. Richter, “Quaker Quips,” Sporting Life, July 15, 1911, 7. 21 Ros [pseud. ], “Fans and Otto Knabe Have Many Wordy Battles During Contest,” Cincinnati Post, September 18, 1911, 6. 22 Francis C. Richter, “Quaker Quips,” Sporting Life, July 17, 1909, 7. 23 On Fogel, see Michael Lalli, “Horace Fogel: The Strangest Owner in Phillies History,” Philly Sports History, http://phillysportshistory.com/2011/07/06/horace-fogel-the-strangest-owner-in-phillies-history/, accessed March 15, 2015. 24 “Hot Shot—From President Johnson,” Cincinnati Enquirer, November 27, 1909, 8. 25 “Zimmerman Traded to Phillies by Cubs,” Chicago Examiner, November 28, 1909, 1. 26 William G. Weart, “Philly Stirred Up,” The Sporting News, November 3, 1910, 1. 27 Rice [pseud. ], “Joe Tinker Verifies His Jump to the Federal League,” Brooklyn Daily Eagle, December 30, 1913, 18. 28 “Fleischmann Attempting to Get Otto Knabe to Manage Redlegs,” Cincinnati Enquirer, August 11, 1912, 14. 29 On Locke, see Shane Tourtellotte, “The William Locke Centennial,” Hardball Times, http://www.hardballtimes.com/the-william-locke-centennial/, accessed March 15, 2015. 30 William G. Weart, “Extremes Kill All Interest in Philly,” The Sporting News, July 17, 1913, 1. 31 Jack Ryder, “Hopeful—Of Winning Next Time,” Cincinnati Enquirer, November 3, 1913, 8; William G. Weart, “Philly Forgets It’s a Prim Quaker Town for a Night,” The Sporting News, October 23, 1913, 1. 32 “Coombs Will Not Pitch Until July,” Philadelphia Inquirer, December 23, 1913, 9. 33 For Knabe’s jumping see, “Offered Federal Berths,” Washington Herald, November 5, 1913, 10; the Otto Knabe affidavit; “Tinker Has Signed for Three Years with New Federal League,” (New York) Evening World, December 29, 1913, 2; Stanley T. Milliken, “Sporting Facts and Fancies,” Washington Post, January 6, 1914, 8. 34 For this background, see Robert Peyton Wiggins, The Federal League of Base Ball Clubs (Jefferson, NC: McFarland, 2009): 99-104. 35 “Letters to the Editor,” The (Baltimore) Sun, July 25, 1914, 6. 36 “Home-Run Clout by Fred Smith Wins Him a Regular Job,” Brooklyn Daily Eagle, June 9, 1915, 22. 37 “Pittsburg Signs Otto Knabe,” The Sporting News, April 20, 1916, 1; Ralph S. Davis, “A Hopeless Note in Pittsburg’s Story,” The Sporting News, May 18, 1916, 2; Ralph S. Davis, “Callahan Gets His Eyes Open to Feds,” The Sporting News, June 8, 1916, 3. 38 Robert W. Maxwell, “Cubs Register Double Triumph Over Red Sox. Knabe Assisting Tyler,” (Philadelphia) Evening Public Ledger, September 7, 1918, 10. 39 I. E. Sanborn, “Cubs Start East to Work Off Long List of Bargain Battles,” Chicago Daily Tribune, August 12, 1919, 17; “Knabe to Lead Blues,” Kansas City Star, June 20, 1920, 14; Alport Hager, “Singing the Blues,” Kansas City Kansan, June 14, 1922, 8; “A New Life for Blues,” Kansas City Star, June 15, 1922, 12. 40 “Gambler’s Rich Layout is Described,” Philadelphia Inquirer, November 9, 1939, 9. 41 “Former Phillie Star Cleared on Charge,” The (Franklin, Pennsylvania) News-Herald, November 10, 1939, 12. 42 ‘Effie’ Walsh, “White Sox Players Were Bought Out in 1919 World Series,” Wilkes-Barre (Pennsylvania) Times-Leader, September 28, 1920, 21. 43 “Gamblers Tried to Buy Local Players,” Philadelphia Inquirer, September 30, 1920, 5. 44 “Phils Offered Bribes in 1908, Says Red Dooin,” Chicago Daily Tribune, October 1, 1920, 19. 46 Note too, the mention of Knabe within the Grabiner diary in Sean Deveney, The Original Curse: Did the Cubs Throw the 1918 World Series to Babe Ruth's Red Sox and Incite the Black Sox Scandal? (New York: McGraw-Hill, 2009): 47-48.